Mississippi State's Brandon Bryant is a safety who will be available in the 2018 NFL Supplemental Draft. A week ago, it was reported that talented Virginia Tech cornerback Adonis Alexander was set to declare for the supplemental draft. According to Tom Pelissero of NFL Network, two more talented players will be joining him. Two more notable names expected to apply for entry to the NFL supplemental draft, per sources: former Mississippi State DB Brandon Bryant and former Western Michigan CB Sam Beal. Both have draftable talent. To give you a quick refresher, the NFL Supplemental Draft occurs every year (typically in July, though this year's date has not yet been set) for players whose circumstances changed their college football eligibility since the main NFL Draft. For example, in 2012, a notable player taken in the supplemental draft was WR Josh Gordon, who failed a drug test at Baylor and was dismissed from the team. The supplemental draft goes round-by-round, and teams lose a draft pick in the corresponding round of the following year's regular draft if they bid on, and are awarded, a player. In other words, when the Browns selected Gordon in the second round of the 2012 supplemental draft, they lost their second round pick in the regular 2013 NFL Draft. Most years, the supplemental draft comes and goes with no players drafted. This year, there are three talented players worth taking. Seeing as the Eagles had just five draft picks in 2018, and are projected to have an abundance of them in 2019, it could make some sense for them to bid on one of the three following players. The early word on Beal is that he was being thought of as one of the early top corner prospects in the 2019 NFL Draft, and is going to be taken in one of the first three rounds of the supplemental draft. In 2017, he had 2 INTs, a forced fumble, and 10 pass breakups. I watched his game against Central Michigan, and there's no doubt that he can cover. As Adam Schefter noted in the video above, Beal is big, he has talent, and he plays a position that every team in the NFL can use. I will note, however, if the below game is any indication, he is horrendous tackler. Unlike most supplemental draft applicants, Beal is high-character player. Of the three players likely to be in the supplemental draft, I would peg Beal as the least likely to be taken by the Eagles. I can't see them using a second round pick on him, which is what it could take, considering they are last in the priority order after having won the Super Bowl. Bryant is a physical specimen who made NFL.com's Chase Goodbread's list of the freakish athletes prior to the 2017 season. Bryant is back as a fourth-year junior with some impressive credentials as a freakish athlete. He's consistently run sub-4.3 40-yard dash times in MSU's team testing, making him one of the fastest players in the game. But at 5-foot-11, 200 pounds, he's also remarkably strong; he can deadlift 600 pounds and squats 450. He can also vertical jump 35 inches, which would have given him a top-10 finish among safeties at the 2017 NFL Scouting Combine. Unfortunately, while he was a contributor in Mississippi State's defense in all three of his collegiate years, his production leaves something to be desired. From 2015 to 2017, he had 157 tackles, 5 INTs, and 7 pass breakups. If the Eagles were to have interest in Bryant, they will want to see that he can man up against tight ends and slot receivers in the passing game. There are no video cutups of Bryant that I could find, but seven pass breakups over three seasons is underwhelming. Bruce Feldman of The Athletic has a brief explanation of why Bryant is entering the supplemental draft. 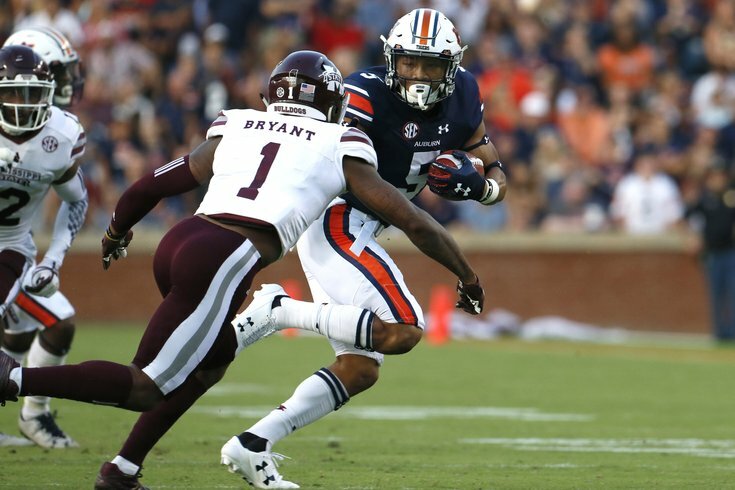 Word is former #MissState safety Brandon Bryant is expected to apply for the NFL Supplemental Draft. Freaky athlete who MSU coaches once clocked at 4.24 in the 40. Had some struggles academically and withdrew from school in the spring. Bryant has speed, and the Eagles signed four undrafted safeties this offseason, which means it was clearly a position where they wanted to get a look at a bunch of young players. And finally, we covered Alexander a week ago, but we'll copy and paste for your convenience. Alexander has played some safety in addition to corner for Virginia Tech. As a freshman in 2015, he had 55 tackles and four interceptions, though his production fell off some in 2016 (44 tackles and 2 picks in 13 games) and 2017 (27 tackles and 1 pick in 8 games). Here's a highlight reel. Use your mute button liberally. Alexander is a tall, athletic corner with ball skills who is not afraid to stick his nose in and make tackles. However, he comes with serious character concerns. In 2016, he was suspended for Virginia Tech's opener after being busted for possession of marijuana. During the season in 2017, Virginia Tech coach Justin Fuente had him stay home for at least one game for 'not living up to' VT's expectations. "We will continue to uphold the exemplary standards of Virginia Tech football," Fuente said. "Integrity, trust and teamwork remain the foundation of this program and that will not change. Adonis has not lived up to our expectations at Virginia Tech. He will continue practicing and participating in team activities. Our staff will continue to monitor his progress and evaluate his progress going forward." This spring, Fuentes dismissed Alexander from the team for academic reasons, according to The Roanoke Times. A couple months ago, the Eagles took a shot on another tall corner with character concerns, when they traded Torrey Smith for Daryl Worley. That was worth the small risk, though it did not work out, as Worley was quickly released because he was arrested shortly after joining the team.